I packed up my laptop, strapped on my gun belt and began escorting the Black Hat to the train station. If I could get him to the train on time, he´d be a prisoner at the Googleplex by tomorrow morning. I mapped out our route through Virginia City…we would head down Main St. all the way to Flowery St. where we would sprint the rest of the way towards the station. Initially, Google Maps showed me the best route to the train was a straight shot across D St. …however, we would be too exposed, making me an easy target for the Black Hat gang. No problem…with a little flick of my finger on my iPhone screen, I made a slight alteration to Google´s route. A journey down Main offered us the greatest amount of cover from our adversaries. I wasn´t nervous as we walked through the hotel lobby / saloon. Sure, the Black Hat crew had run off the Pinkerton men, shot the local sheriff & coerced the local folk to turn against me. However, they failed to take into account two important factors…I was a crack shot with all types of weaponry and I had the technology that would get the Black Hat & I safely to the train station on time. We walked out the front doors of the establishment onto Main St . It was a brutally hot and very windy day in Virginia City. The streets were deserted. A huge patch of tumbleweed blew past us. Morricone´s theme from “Once Upon A Time In The West” played in my head…wait, it was playing through the earpiece of my iPhone. I shut off the music to better concentrate on the task at hand. Was Matt still at work? Was he playing Halo 3? Hard to tell. As we walked by the Bucket of Blood Saloon, a hail of gunfire erupted all around us. I pulled the Black Hat down to the ground as we took cover behind some old whiskey barrels just outside the Saloon. I returned fire and blew away a couple of their outlaws in the street…however, it was quite clear they had several men on rooftops and we weren´t going to get anywhere near the train station if I didn´t take them out. Suddenly, I remembered that I´d seen a live webcam feed of Main St. on a local merchant´s website. Perhaps, I could use it to see the positions of some of the Black Hat Gang. 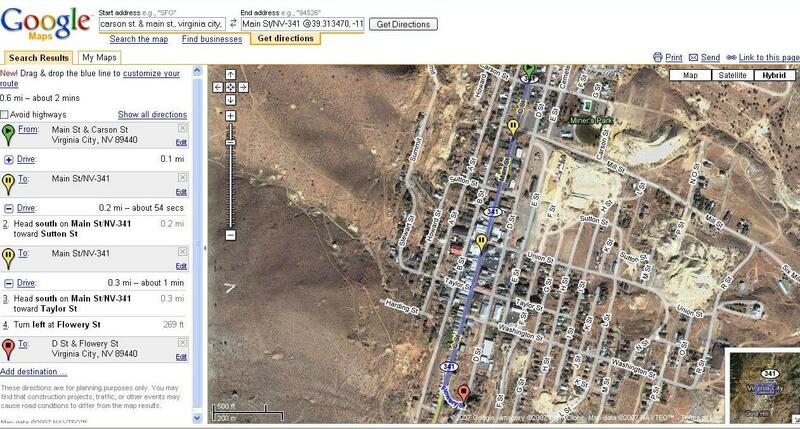 As gunfire sounded around me, I quickly pulled out my iPhone and Googled the URL of the Virginia City Webcam. I was in luck…I had a strong Wifi signal and the camera gave away positions of 4 of their men. Leaving the Black Hat out of harms way (I could tell he didn´t want to risk being shot in the confusion), I dropped my iPhone in my shirt pocket and ran out in the street with pistols in both hands. I shot two outlaws perched on the balcony of the Red Garter…they broke the railing of the balcony as they fell down to the street. I quickly dropped to the ground, rolled over, and shot two men perched in the windows at Molinelli´s…one fell out of the window on the hotel awning and one slumped back into the room. I sprinted back to collect the Black Hat. I still had no idea if Matt would be at the train to meet me. I pulled out my iPhone to see if could reach him via IM. Matt Cutts appears to be offline. Messages you send will be delivered when they sign in. Great. Suddenly, I received an incoming IM. Who could it be? My wife back at our “soon to be repossessed” ranch? My son who had pulled a gun on the Black Hat when he had one on me? Another member of the Google Spam Team? Hotsexybarelylegalteens : Cowboy I So Hot 4 U Tonite. Wanna Be My Boyfriend? Another Viagra Spammer. I bet I´m going to be asked to click AdSense ads too. I clicked her (him?) off and tried to IM the train station. DeadeyeDan: Trainmaster, is the 3:10 to Mountain View running on time? VirginiaCityTrainDepot: Running a bit late. What´s all that gunfire I´m hearing from town? Is that your doing Cowboy? I clicked off. He´d know soon enough. I already knew all this. I saw nothing that helped my current predicament. I reached slowly into my shirt pocket for my iPhone and as I brought it out, a bright beam of sunlight reflected off its surface right into his eyes. Just then, the Black Hat drew his pistol and put a third eye between his other two with a single shot. The Black Hat walked over to the corpse and retrieved my iPhone. He then handed back my pistols. The Black Hat wasn´t lying…in my inbox was an email from Google saying that if I agreed to complete the mission and signed off on a broad non-disclosure of anything having to do with it, Google would pay off my mortgage at the bank, force the railroad to assign me back the water rights to my property in perpetuity & deposit $10,000 into my bank account at that same bank. I agreed to the terms. I then immediately received an email from the bank confirming the mortgage fulfillment & deposit and one from the railroad confirming my water rights. I now had a strong feeling I had been part of a very elaborately staged event. Perhaps a greater good was being served by all of this…however, I didn´t quite see it. All I saw was a lot of dead bodies lying in the streets of Virginia City , a whole bunch of property damage, and a populace scared out of their wits from all the shots fired. Would the suits in Mountain View ever know what events had to transpire in order to fulfill their objectives? Would they ever hear the stories from all those affected? Will they ever see the damage? I doubt it. The Black Hat confirmed that his “gang” had all been wiped out. So, we left our hiding place and walked further down Main St. where the buildings thinned out and where we saw nice homes and beautiful churches. We turned onto Flowery Street and walked directly to the train. • For a person of such considerable power, he was an amazingly friendly, down-to-earth great guy. • Never had I seen anyone look worse in western clothing. He could not pull off the cowboy look at all. The train pulled out of the station for the journey to the Mountain View. Matt posed for a photo with the Black Hat but was quickly pushed aside in favor of Google´s top Media Relations people who needed to prep the Black Hat for the surprise Googleplex press conference. Wall Street was expecting record quarterly earnings from Google and with the upcoming Annual Shareholders Meeting looming, Google´s top execs were working on programming the news that they would be presenting to investors.